Cosmonaut Oleg Skripochka works with the free-floating, bowling ball-sized satellites (in orange and red) also known as SPHERES. Two NASA astronauts are readying their spacesuits and gear ahead of an Aug. 19 spacewalk. More life science, including heart and DNA research, continued Friday. Finally, tiny internal satellites were tested before next week’s student competition. Commander Jeff Williams and Flight Engineer Kate Rubins inspected the spacesuits they will wear in two weeks during a 6.5 hour spacewalk. The duo will complete the installation of an International Docking Adapter to the Harmony module. The first of two new adapters will allow Commercial Crew vehicles being developed by Boeing and SpaceX to dock in the future. Rubins continued more work on the Heart Cells experiment today while Takuya Onishi, from the Japan Aerospace Exploration Agency, tended to the Mouse Epigenetics hardware. Cosmonaut Anatoly Ivanishin joined Williams during the morning collecting and stowing biological samples for the Fluid Shifts study. Next week, high school students will compete for the best algorithm to control self-contained, bowling ball-sized satellites inside the station. The algorithms control the tiny satellites and test mission and research functions to advance future space missions. 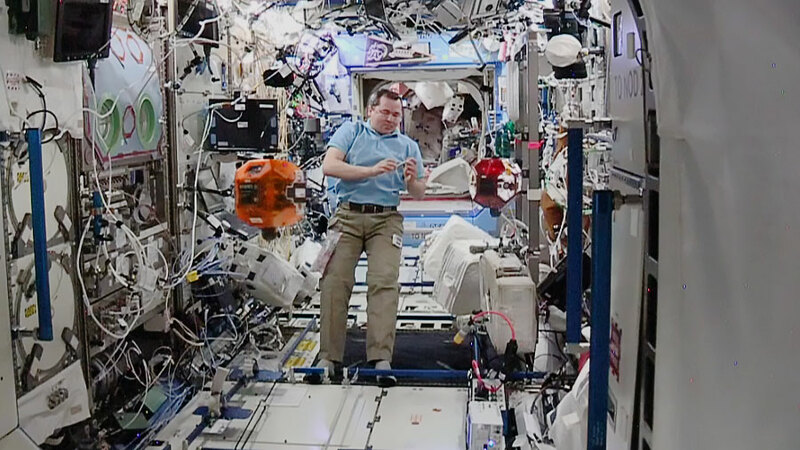 Cosmonaut Oleg Skripochka tested the satellites inside the Destiny lab module today for the SPHERES Zero Robotics competition. All of you are incredible! Thank you so much for advancing science for all of Humanity! Hope our children grow up to be just like you.